It is thrilling to find a mention of an ancestor in a newspaper of the time in which they lived. There are few other contemporary sources of such detail about their daily lives. Even if we can’t find our ancestor or other relatives by name, we can still get a very good idea of what their lives were like in those days by reading the paper they would have read. Small local newspapers are especially helpful in that their search for news may have included family news, wedding photos, anniversaries, gossip and even obituaries for which larger metropolitan newspapers would not have the space or interest. 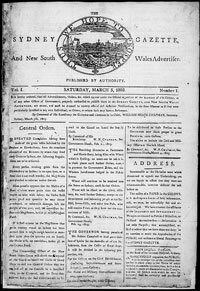 The first newspaper published in New South Wales was The Sydney Gazette and New South Wales Advertiser. The first issue was published in 1803 and can be seen here. The Sydney Herald, first published in 1831, became The Sydney Morning Herald in 1842 and is still published today. Most newspapers for which copies exist have been microfilmed as part of the National Plan for Australian Newspapers, a joint project by the National and State libraries. A brief history of Australian newspapers can also be found here. The Australian Newspapers project coordinated by the National Library of Australia has released a beta version of the website. They chose one newspaper (or more) for each state and started digitising them to make them available online. For New South Wales the Sydney Gazette and New South Wales Advertiser has been digitised up to 1815 and the Maitland Mercury and Hunter River General Advertiser for the 1840s, early 1850s and early 1880s.